Browse: Home / mimikatz v2.1 alpha – A little tool to play with Windows security. 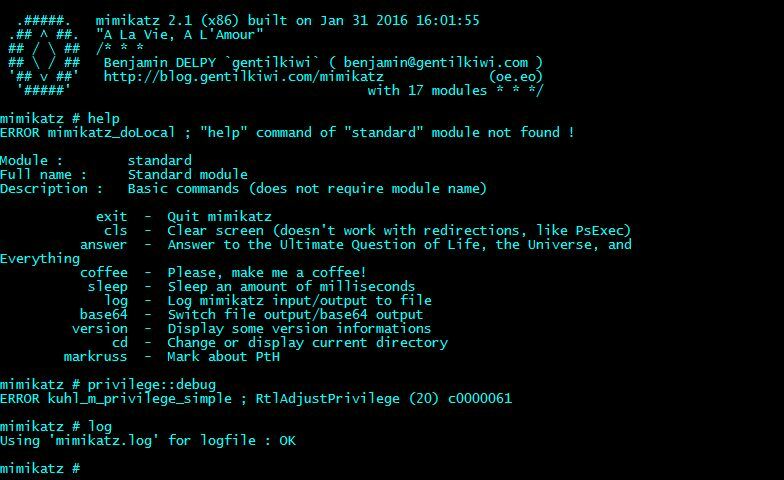 mimikatz v2.1 alpha – A little tool to play with Windows security. mimikatz is a tool I’ve made to learn C and make somes experiments with Windows security. It’s now well known to extract plaintexts passwords, hash, PIN code and kerberos tickets from memory. mimikatz can also perform pass-the-hash, pass-the-ticket or build Golden tickets. — you can have error MSB3073 about _build_.cmd and mimidrv, it’s because the driver cannot be build without Windows Driver Kit 7.1 (WinDDK), but mimikatz and mimilib are OK.
← BetterCap v1.3.3 – A complete, modular, portable and easily extensible MITM framework.